Once upon a time, in a land far, far away, lived a girl. She was an ordinary girl. Not a wallflower, but not a high-flyer either. She was loved by her family, got on well(-ish) at school, had the requisite number of boyfriends and breakups, and battled the occasional outbreak of pimples with spot cream and floor gazing. In short, ordinary. But one day, empty of wallet and loathe to keep tapping a generous-to-a-fault father for yet more money, she decided to get a Saturday job. So, armed with a short resume consisting of kid’s movie reviewer for the town newspaper, church choir member, and zero retail experience, this girl left the house. More in hope than expectation. The first shop she entered was quite daunting, with low lights and a cluster of employees talking and laughing. Her hands were sweating and her breathing shallow, the resumes crumpling in her trembling hand. She felt like she had entered a party uninvited. With toilet paper on her shoe. The group looked her up and down with disinterest, then turned their backs, returning to their no doubt scintillating conversation about Duran Duran, or some such. Just as she turned to leave, humiliated, a man caught her eye. He looked harassed but smiled pleasantly at her, boxes and bags balanced precariously in his strained arms. She asked if he needed a hand, which he did, and she opened the door, accompanying him out into the still, hot evening air. It turned out that Roy was just getting ready to open a popcorn shop. Yes, a popcorn shop. This was a curious new retail concept for the ever-hungry, ever-snacking Americans who, having temporarily fallen out of love with doughnuts, had fallen in love with fiber. Or at least salt. Roy had just that very day been told by his wife that he had to find someone to help him work in the shop. He told the girl that he was recovering from a heart attack and that his wife worried that this new venture, fun though it might be, would send him right back to the hospital. And, as she was the new mother of twins, she couldn’t possibly help. Of course the girl was me. The very next day I started at the shop, called – oddly – “I Love Popcorn.” From the get go I was popping on an industrial scale, mixing flavours to order. Nearly everyone who walked past this store, with its enticing smell of popping corn, was drawn in. Some came just to gawp at the flavour board (chocolate-peanut butter was my favourite), while others walked out with far more bags than anyone could possibly eat. I had a wonderful time in this curious store, with its back room filled with all manner of outsized bottles, colourful bags of powders, flapping machines wheezing popcorn, and gleaming pots and pans. It was like the most delicious chemistry set for food nerds. Looking back through the haze of the (many) intervening years I think that this chance meeting and fun, but unchallenging, job was a huge life lesson. That lesson being: listen to your instincts, they’ll almost always be right. You see, I could have brushed past the man and gone on to the next store with my shabby sheaf of pathetic resumes, probably ending up working in a boring shop, gossiping with fellow employees and ignoring customers. But I just thought, that man needs a hand so I’ll give it. He said later that he would have never considered someone my age, seeing us all as rather irresponsible and ill-mannered. I was glad that this one brief encounter not only had him perhaps rethink the teenage species, but confirmed to me that I should trust my judgment. To this day I have clung to this thought, and it has rarely let me down. Sure, there have been some terrible choices – mainly of the haircut and clothing variety (one reason I’m not on Facebook!) – but by and large I get away with listening to my inner voice. This is something I encourage participants on my cancer nutrition courses to do as well. When we are young we are hugely instinctive little creatures, gravitating towards those who love us and avoiding those we mistrust. We also eat when we are hungry and not because the clock says so, and in amounts appropriate to our growing, active bodies. Certainly as I’ve got older I have to work harder to hear the tiny squeaking voice that says, “you don’t need a second helping,” and “that piece of fruit is a better choice than that bag of crisps.” I think most of us are like that. We get socialised and quasi-brainwashed into eating in certain ways that go against our natural instincts, which is to nourish ourselves. Does that sound familiar? It’s hard sometimes, especially when things go wrong or worrying in other aspects of life. Food is a comfort and a haven for many of us. But I guess it’s about working out a balance between gut instinct (excuse the pun) and our need for the familiar and comfortable. Which leads me back to popcorn. If you have made it this far – congratulations, you get an awesome snack! Popcorn is a familiar, comforting food for many Americans. However, whereas back in the olden days (pre 80s) it was a purely DIY affair of pouring popcorn kernels into a pan slicked with hot oil and waiting for the popping to cease, now it is most often a bag stretching and pinging to life in a microwave. You know what I’m going to say, don’t you: don’t do it! 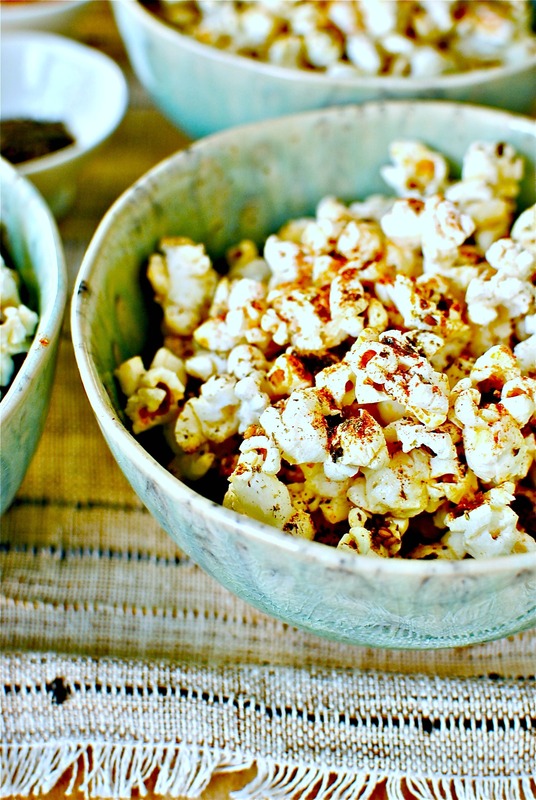 Step away from the microwave popcorn! We have recently found out that not only is popcorn an awesomely delicious snack food, it is actually very good for us, with more heart-healthy polyphenols than many fruits and vegetables. But not from a bag. It’s not the microwaving that is the issue, but the nonstick lining of the convenient little bag. When it is heated the chemicals lining the bag are agitated and released, entering the lungs upon opening. That smell and warmth? It is wafting some pretty dodgy stuff. These chemicals are said to hang around in the lungs for years. Prevention magazine named it as one of the 7 foods that should never cross your lips. Wow. Pretty damning stuff when you think that we live in a world giving us a burger that packs in over 1000 calories between its buttered buns. Another idea is to pour a few tablespoons of popcorn into a brown paper lunch bag, fold the top over a few times and microwave on HIGH for 2 minutes. I’ve seen this on a few reputable websites but not tried it. Nervous Nelly me would urge caution (is there a risk of fire, I wonder). When you get your first apartment, make a good set of pans, plain canola oil and a bag of popping corn one of your first purchases. I use plain, non-virgin rapeseed/canola oil for popping corn, but others like coconut oil and olive oil (I sometimes use olive oil for plain corn). I favour rapeseed oil for not only its high burning point (a good thing) but also its neutral flavour. The short cooking time and constant agitation will undoubtedly mitigate against any dangerous chemical changes that occur with cooking at high temperatures with oil. But I would still caution against using extra virgin oils and highly flavoured seed oils, like sesame, for any high temperature cooking. If you can’t find nori sheets you could use what are called ‘seaweed snacks’ or even crumpled kale chips (bought or homemade). As for the togarashi, it is easy to make and keeps well. Otherwise you can buy it at any shop that sells Japanese products (I think Waitrose still carries its own brand own). This is my heavily tweaked adaptation of Nori Popcorn, found in Sprouted Kitchen by Sara Forte. I’ve also got a White Chocolate Popcorn with Strawberry and Rosewater recipe. 1. In a large, lidded heavy pan heat the rapeseed/canola oil with two popcorn kernels. When these pop quickly add the remaining kernels and the sugar; cover. The corn will sizzle and start to pop, crescendoing to a frenzy before petering out to a few seconds between pops. 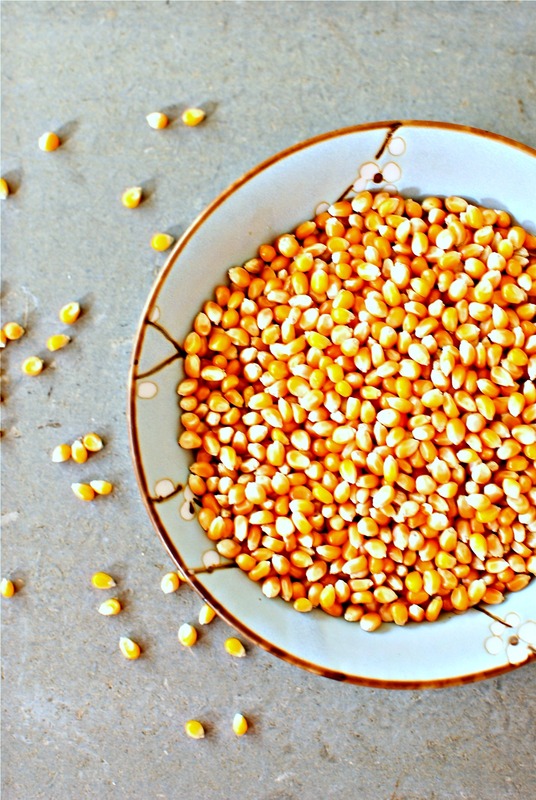 Shake frequently and vigorously during the 2 to 3 minutes it takes for the corn to finish popping – every 5-8 seconds. 2. 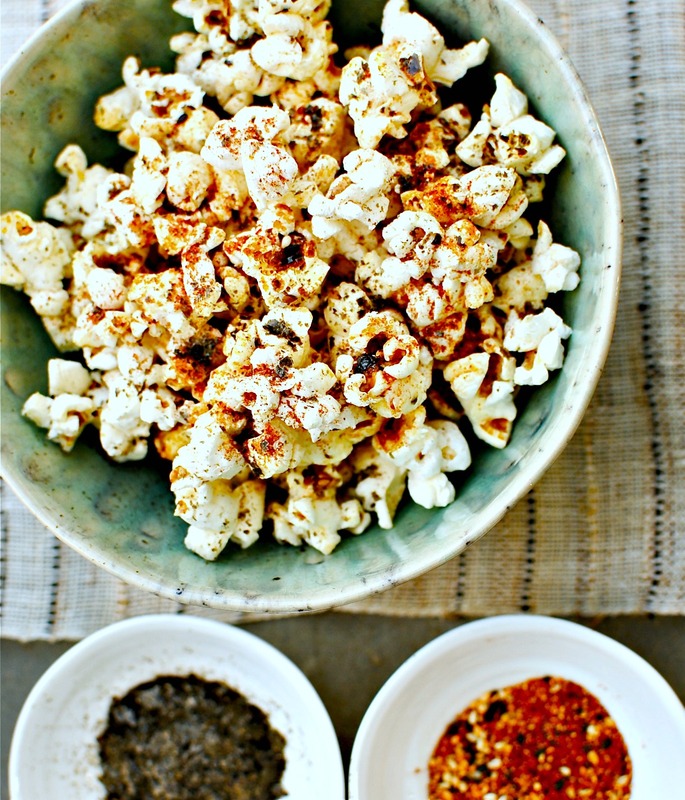 Pour the popcorn into a large, wide bowl and toss through the nori crumbles, togarashi (or chilli powder), sesame seeds and salt. Divide the popcorn between individual serving bowls and sprinkle with toasted sesame oil and an extra flourish of salt if you like. Enjoy! 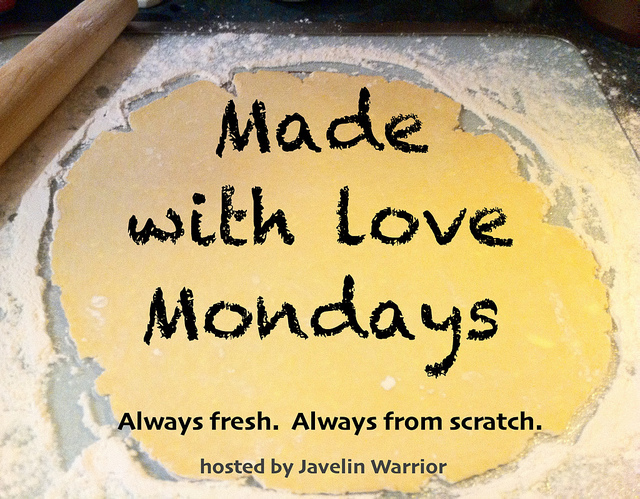 I am sending this quick and easy no-brainer of a recipe to Mark at Javelin Warrior Cookin’ w/ Luv for Made With Love Mondays. I’ve actually got a wee pressie for you which I keep forgetting to give you (you know what my memory is like…) It’s ZaraMamas ‘Midnight Blue’ corn, a naturally grown GM free blue corn which I bought in Balgove Farm Shop in St.Andrews, which when popped turns a stunning bright white (sorry to be so colourcentric but you know I can’t help that). Thanks for my little present my lovely friend. I will save it for myself – no sharing! I also remember a time when I lived on microwave popcorn. I may have come across the same article – I remember reading a list of foods that doctors said they would never eat because of the health risks – among them microwave popcorn. I believe it also said the chemicals can cause infertility. I haven’t had microwave popcorn since. This looks like a great & tasty alternative! Thanks for sharing. 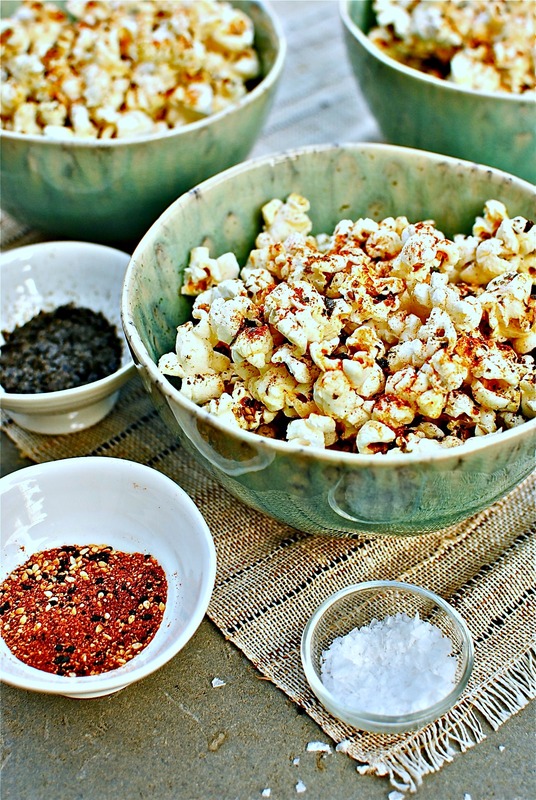 Great recipe– in San Francisco a similar popcorn is sold at Hspantown festivals. So good! Love the story, too. What a lovely story to read on a Friday afternoon. I did fell taken back in time and bet you had some great fashion and haircuts in the 80s! I remember the days of Saturday k=jobs well and was lucky enough to work with 2 of my best friends in my job. We had a great time together. As a popcorn lover I am quite appalled by the story of the microwave bags and the damage they do so I will try to male it in a pan from now on. Love your toppings. I had a nice one last night created by Marcus Wareing which was a smoked butter flavour. Think I would have added some chilli flakes to it! MMm smoked butter, how very exotic! Love the sound of that. I shouldn’t even try that as I would just eat the entire bowl to myself. I will forget I have heard of such a thing! I love popcorn. We were introduced to it by my WAY ahead of her time grandmother who grew her own blue corn and we popped it on the stove top with oil in a large pan and ate it dusted with icing (confectioners) sugar. I sometimes wonder why I still have teeth ;). My first job was in a fish and chip shop and again, I sometimes wonder why I can still pull up my pants and am not wearing a mumu similar to Homer Simpson. I love food and this popcorn looks to be a sterling effort at “food”. Cheers for sharing the back story and the grub. As always, there is a wonderful story woven between the recipe and the gorgeous images and if you play the music folks…it makes the perfect holistic post :). Nope…I still lust after that gorgeous puffy batter and chips ;). As a vegan of 18 years (vego for 5 years before that) who doesn’t eat fried anything any more I can still remember the taste ;). Gran was WAY ahead of her time and I remember her herb garden and the strange and unusual creations she made from them. I have my snack sorted now for Strictly Come Dancing tomorrow! 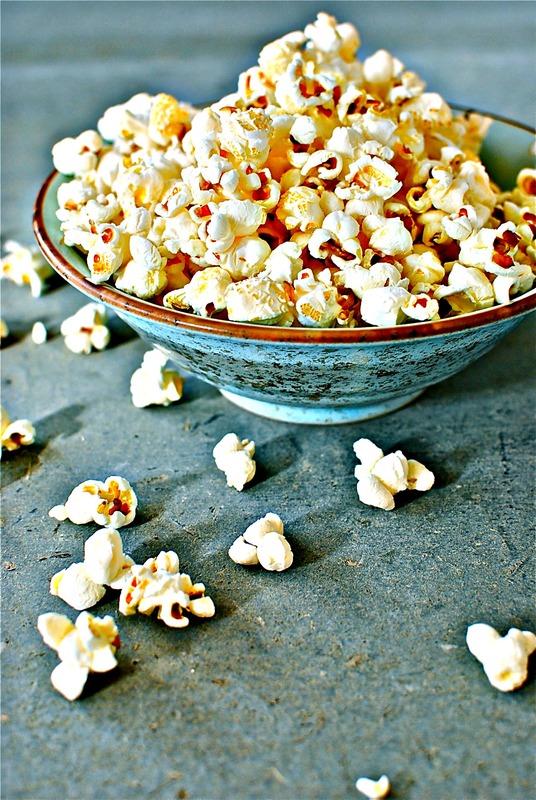 I have always been addicted to popcorn since I was little, my favourite way is still the most simple, popped on the stove, with salt and nothing else! I think it tastes much nicer popped fresh from a saucepan so I never use microwavable popcorn, did not know of the negatives of it though! Kellie, your story had me in awe from the beginning, such a wonderful story and you tell it so well! I think this would have to be my most favourite of all your posts! I truly enjoyed your story. i’m a great lover of popcorn also and almost always have some on hand already to popped to munch on. I can attest to the fact that popping corn in a brown paper bag works just fine. I do it all the time and you can even reuse the bag. Thanks for confirming this for us Jacquie. I don’t have a microwave oven or I would certainly try this for myself. I have often made popcorn in a brown paper bag with no problems. I puff up the bag first (as if I was puffing it up to pop it a la 3 stooges style). I also reuse my bags because sometimes you just find a lovely big brown paper bag from a store and they’re much better than those thin brown lunch bags. These days, my husband likes stove popped and if we want new flavours we add some nutritional yeast and salt. Very yum. What a great way to incorporate nori in everyday eating! And lovely story, Kellie. I could not agree more with your message to follow your instincts. Living and eating instinctively is a key to health and well-being in my mind, and the sooner we gain back that instinctive childhood trust of our bodies, the better off we’ll be. In fact, is it not always about ‘discipline’ but more about bringing mindfulness to decisions about food we choose to eat and how we choose to eat it that’s the most important? Ironically, I just wrote something similar. 😉 Maybe it’s the fresh start of a new season that is placing these ideas front and center for us! I’ll have to go and have a look, Katie. 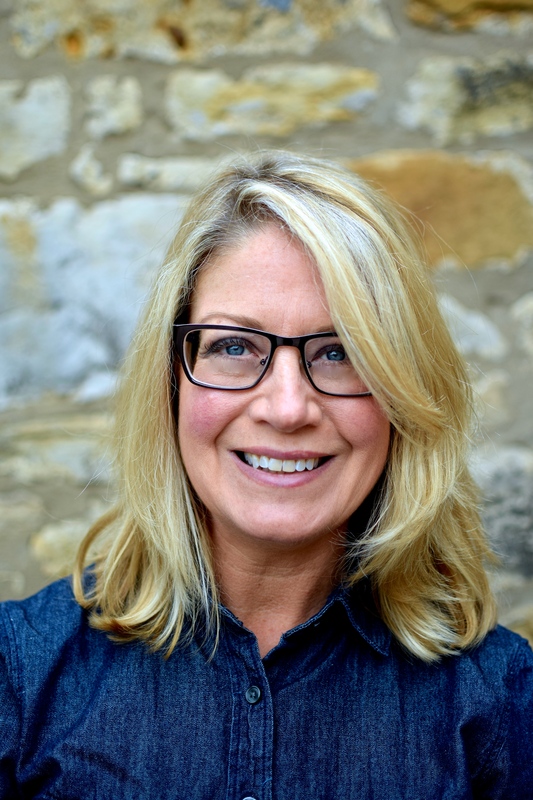 We talk a lot about mind-body connections and instinctive eating in my weight management classes for post-cancer treatment patients and it really strikes a chord. No diets, just listening to your body and being informed about what goes into your mouth is often all that is needed. I loved this story. Just goes to show that you’ve always been a kind, caring individual Kellie. Popcorn looks great too. I loved reading your story! it’s scary to think about all the harmful chemicals surrounding us, I’m an advocate for clean living too so I totally can relate, we just have to do the best we can to protect ourselves 🙂 thanks for sharing! Gorgeous photos, Kellie! As you know I am a popcorn lover myself, and as I’m sadly out of Old Bay seasoning I think it’s time to mix up the toppings a bit. I’ve tried the nori thing, but never thought of doing it with kale! I’ll have to reserve some from my next batch of kale chips and give it a go! Aww – what a lovely tale Kellie and it looks like you have kept your good instinct with you throughout life. I have to say your popcorn is probably the most appetising I have seen in a long time and such an original flavour too. You’re posts and accompanying advice is fantastic. I hope my blog is just as enlightening as yours. I think this spice combo would be amazing in toasted coconut flakes too. That is without the sugar. I think this spice combo would be amazing in toasted coconut flakes too. Without the sugar.